This innovative product is known as the "green wall". It allows you to grow plants on either an indoor or outdoor wall. You can have the space you've always dreamed of with this amazing hanging grow bag! Transform any boring wall into a botanical garden. Made from environmentally-safe felt material that is non-toxic and biodegradable. Will not corrode! Weather resistant! Made to last a long time! It's perfect for planting a variety of plants such as flowers and even berries! The hanging bag is reusable, easy to transport, affordable, and functional. The design is lightweight and very easy to hang and move. The four corners of the bag have holes that make hanging a breeze. Excess water drains through the felt material. The felt is also highly absorbent. 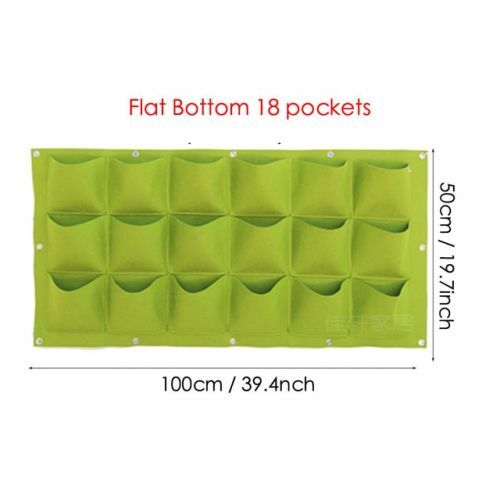 Model and type:18 pockets vertical/level round,18 pockets vertical/level flat. Total Size: 0.5* 1m/1m*0.5m .